This guided tour of Northeastern United States and Canada begins in New York City—the “Big Apple”—with a sightseeing tour of New York City’s most iconic spots, including the Empire State Building, China Town, and Broadway. Travel to Philadelphia to see the Liberty Bell and Independence Hall, and visit the nation’s Capital, Washington, DC. You’ll see famous landmarks, including the Vietnam, Korean, and Lincoln Memorials. Snap photos in front of the White House, and enjoy free time to explore one of the many museums of the Smithsonian Institution. You’ll travel through the pastoral landscapes of Pennsylvania and visit a farm in the Amish countryside of Lancaster. Pass through the Appalachian Mountains to the border of New York and Ontario, Canada—to experience majestic Niagara Falls. Next, enjoy Lake Ontario, and travel through vineyards and farmland to arrive in the cosmopolitan city of Toronto. Visit Ottawa, the capitol of Canada to see the Royal Canadian Mint, Arts Centre and state residences. From Montreal’s Notre Dame Cathedral, and the banks of the mighty Lawrence River, you’ll also enjoy fine sights and cuisine in the French-Canadian province of romantic Québec City. This morning, you may opt to take the optional helicopter flight over the falls. Then board a Niagara Falls sightseeing CRUISE for a thrilling boat ride to view the thundering falls from river level. Later, drive around the "Golden Horseshoe" of Lake Ontario and through vineyards and rich farmlands to Toronto, the cosmopolitan provincial capital. (B) NOTE: Operation of the Niagara Falls sightseeing cruise is subject to favourable weather and/or river conditions. Favourable conditions usually exist from May to November. When conditions are unfavourable, a walking tour through the scenic tunnels will be substituted. 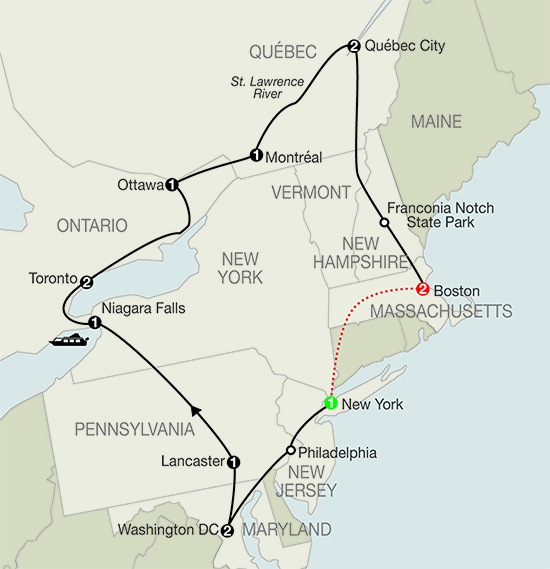 QUEBEC CITY-FRANCONIA NOTCH STATE PARK-BOSTON.